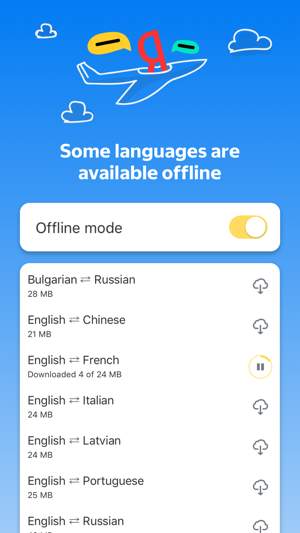 • Translate from French, German, Italian, Russian, Spanish, Turkish and other languages to English while offline: download these languages for free and enable the offline mode in Settings. 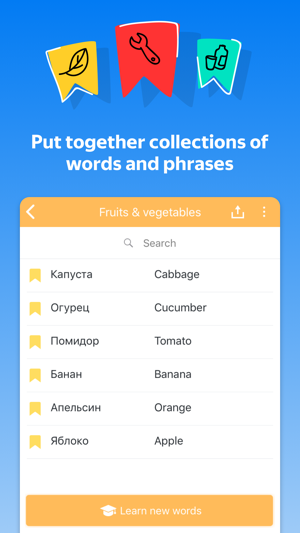 • Speak words or phrases in Russian, English, or Turkish to translate them into any of these languages, or have the app read the translations to you. 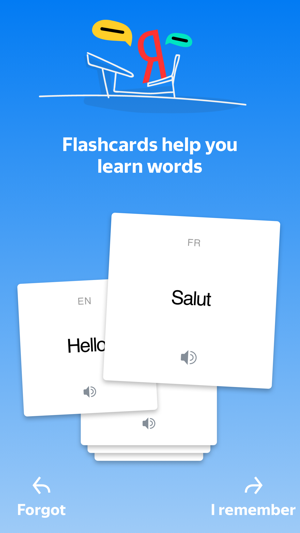 • Take a picture of a menu, road sign, book page or choose a photo with text from your Camera Roll to view its translation right over the image (only available when you are online). • Translate entire sites directly in the app or in Safari. • Read books, news, or articles in a foreign language together with Yandex.Translate on your iPad using Split View. • Read transliterated Arabic, Armenian, Farsi, Georgian, Greek, Hebrew, Korean, Japanese, or Chinese Pinyin. • Speak to your Apple Watch to see your words translated on its screen. Currently supported languages: Afrikaans, Albanian, Amharic, Arabic, Armenian, Azerbaijani, Basque, Bashkir, Belarussian, Bengali, Bulgarian, Burmese, Bosnian, Catalan, Cebuano, Chinese, Croatian, Czech, Danish, Dutch, Elvish (Sindarin), English, Esperanto, Estonian, Farsi, Finnish, French, Galician, Georgian, German, Greek, Gujarati, Haitian Creole, Hebrew, Hill Mari, Hindi, Hungarian, Icelandic, Indonesian, Irish, Italian, Japanese, Javanese, Kannada, Kazakh, Khmer, Korean, Kyrgyz, Latin, Latvian, Lao, Lithuanian, Luxembourgish, Macedonian, Malagasy, Malaysian, Malayalam, Maltese, Maori, Marathi, Mari, Mongolian, Nepali, Norwegian, Papiamento, Polish, Portuguese, Punjabi, Romanian, Russian, Serbian, Scots, Singhalese, Slovakian, Slovenian, Spanish, Sundanese, Swahili, Swedish, Tagalog, Tajik, Tamil, Tatar, Telugu, Thai, Turkish, Udmurt, Ukrainian, Urdu, Uzbek, Vietnamese, Welsh, Xhosa, Yiddish. • Suggestions are now easier to work with: when you choose a suggestion, it doesn't appear at the end of the text, but gets inserted at the cursor's position. 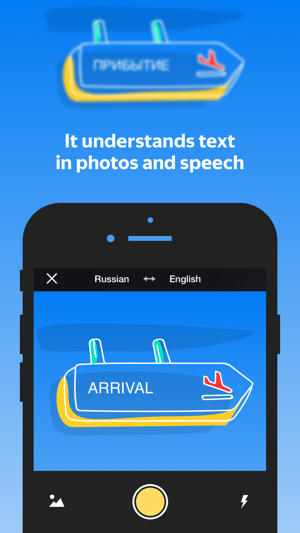 • Photo translation is now more reliable when identifying blocks of text. Yandex offers more information for translations than Google Translate, and the translations feel like they are more accurate. 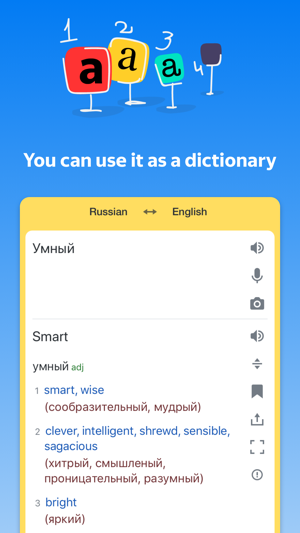 As a polyglot I use both yandex translate and google for different languages, but when it comes to Russian yandex is the most reliable, both for the literal entries and the sound clips. The UI is ergonomic, allowing you to quickly clear the screen and enter another word for translation or swipe to previous queries. 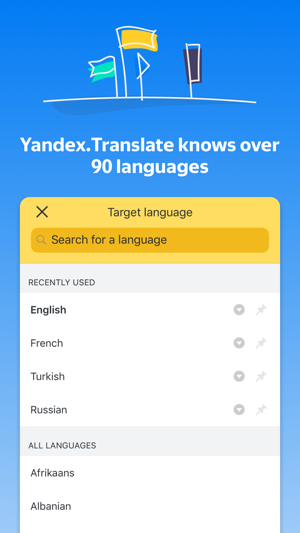 If you’re a student of Russian, Yandex is a must. The Best English/Russian translator available. 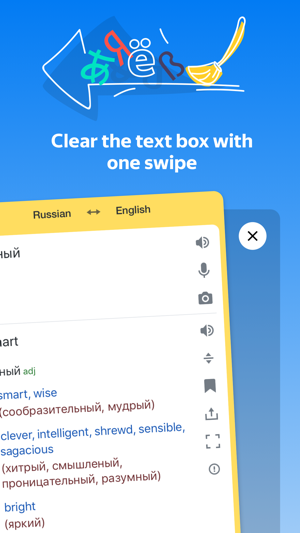 Google translate is very good too, but in my opinion Yandex translator has a slight edge. I enjoyed the fact that they maintained compatibility with my first model iPad long after Apple and Google dropped support. Super product Yandex development team! Absolutely the best translator I have ever used!!!! !